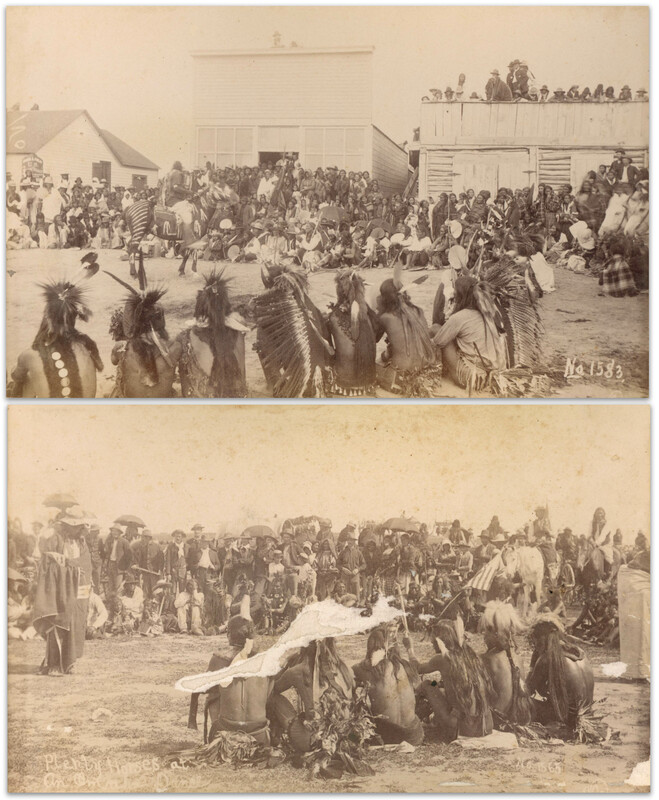 Two original albumen prints from 1891, taken by Northwestern Photo Co. of Chadron, Nebraska, whose outfit is well known for documenting the aftermath of the Wounded Knee massacre. One photo depicts Plenty Horses, the Lakota man famously exonerated at trial for shooting an Army Lieutenant eight days after the Wounded Knee massacre. His defense argued that the Lakota Sioux and the U.S. government were enemy combatants at the time, thereby precluding a murder charge; if they weren't, the soldiers who massacred the Sioux would have to be tried for murder as well. Both the photo of Plenty Horses and the photo on the reserve of the mat were taken on the 4th of July 1891 by photographer Clarence Moreledge at the Pine Ridge Agency, each numbered in the negative, with the Plenty Horses photo additionally reading ''Plenty Horses at an Omaha Dance'' in the negative. 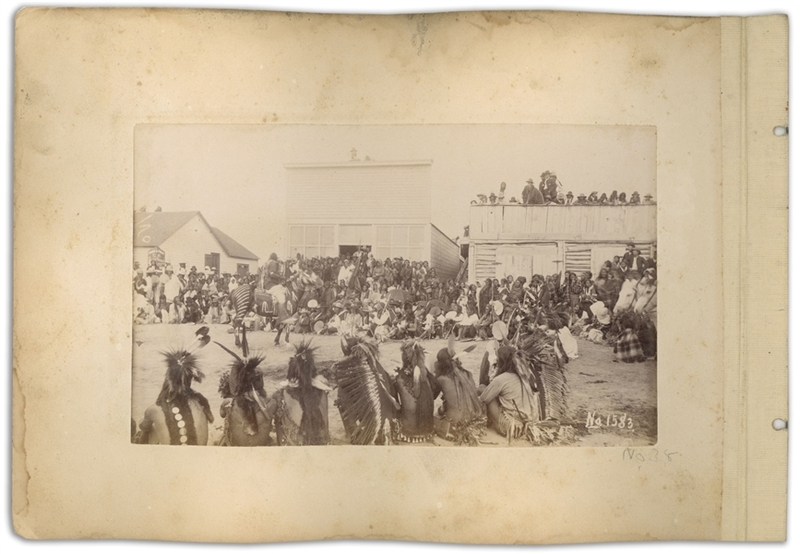 The second photo, published in ''Eyewitness at Wounded Knee'', also shows the Sioux performing the Omaha Dance. 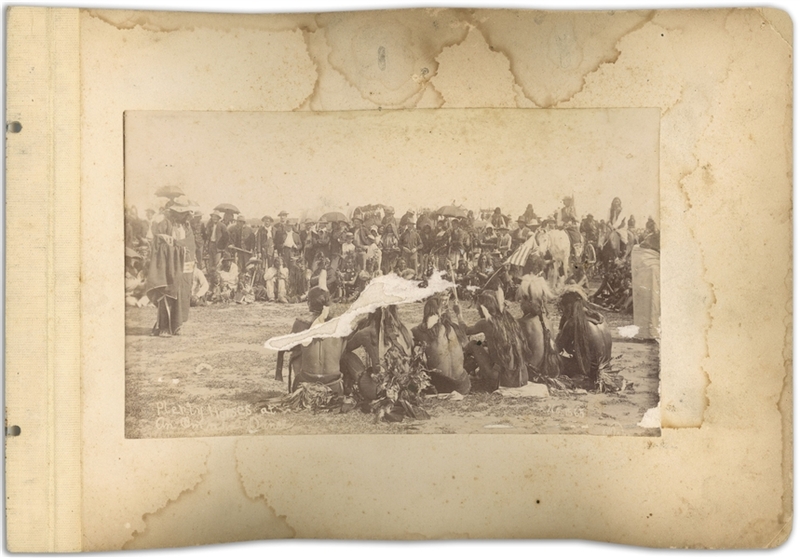 Photos measure 7'' x 4.25'', affixed to an album mat measuring 10'' x 7''. Some buckling and staining to mat, with an abrasion to the center of the Plenty Horses photo. Good to very good condition.